I’m calling this my triple P curry. 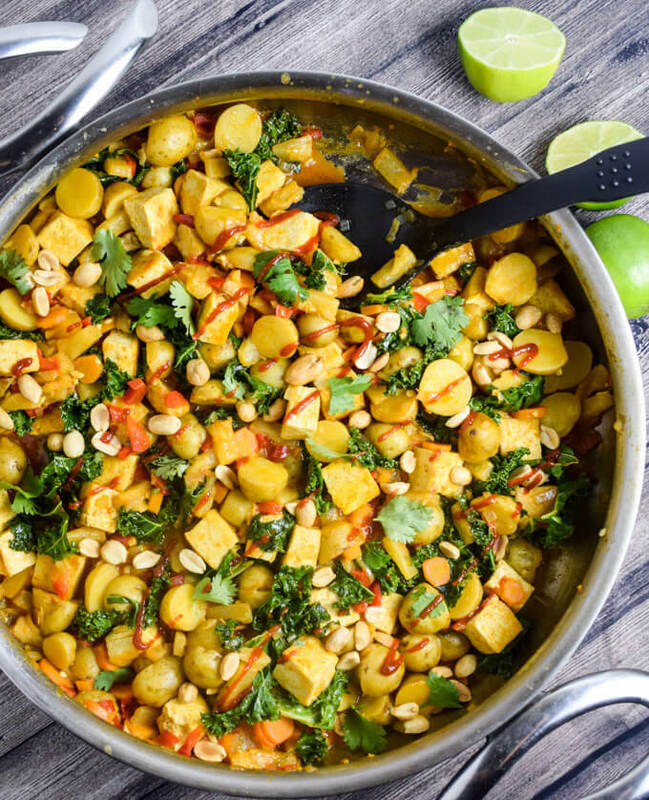 It starts off the way a lot of my curries do – with fragrant curry paste sauteed with aromatics before slowly building the flavors into a stew – but there’s just something special about this peanut, pineapple and potato curry. The vibrant colors, warmth, and bold flavors will keep you coming back for another spoonful. We’ve been having some unseasonably warm weather here, and haven’t gotten any real snow yet. The week before last, it actually hit the 70s and I bicycled home from work in a T-shirt, which gave me that yearly feeling of relief remembering winter isn’t permanent. 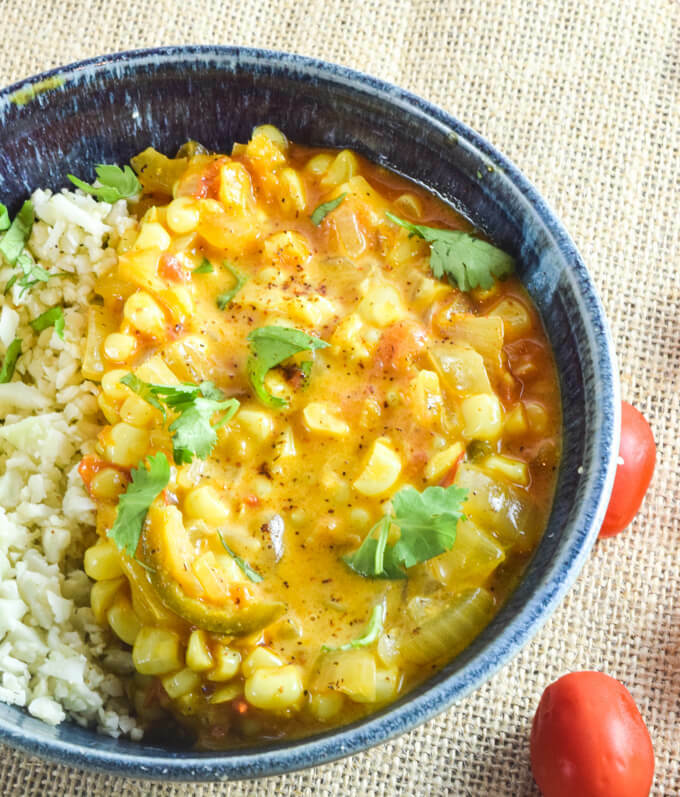 Mostly, it’s been in the 40s, which is still a totally acceptable temperature for a warm, hearty, comforting curry, although I’ve been making this recipe since the summer and it was nice then too! (Yes, this is another one of those recipes I’ve been holding out on you for months. If you ever want to move a specific recipe up in the queue, I accept bribes of Vtopian cheeses and raw cacao butter :D). My recipe is inspired by a dish on the menu of One World Cafe in Baltimore. 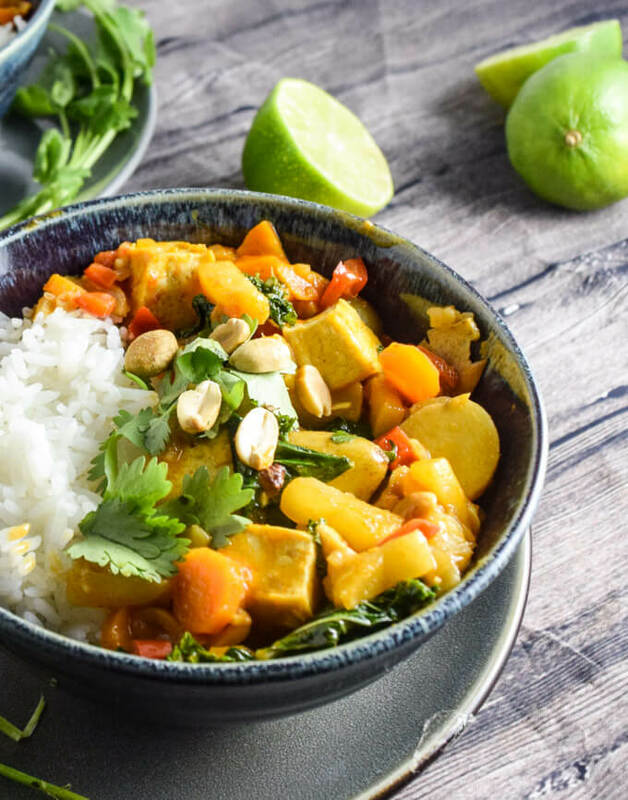 I’ve never actually ordered theirs – I guess if I’m eating at a restaurant I like to order things I don’t think I would or could make as nicely at home, and I make a damn good curry! Still, I liked the idea of the ingredients they used, so I decided to make my own peanut, pineapple and potato curry. I have no idea how much the seasonings have in common, and after I had already made my version, I found out they actually have sweet potato in theirs (I used regular potato). They also leave the pineapple in rings and have huge chunks of potato. I chose to dice most of my veggies because I don’t want to use a fork and knife to eat curry, dangit! The baby potatoes were sliced in half so that they could soak up the sweet, coconutty goodness of the broth while they cook. I also added some baked tofu to bulk this meal up even more, but you can leave that out or use chickpeas, seitan, etc. if you prefer. 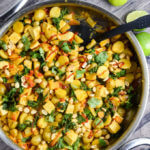 I hope you enjoy my “triple P” pineapple, peanut and potato curry. 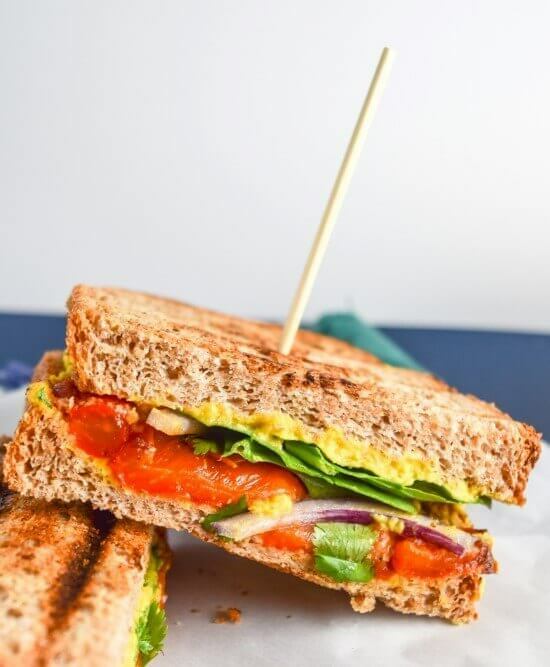 If you make this or my other recipes, don’t forget to share your feedback here and/or tag me on Instagram with @yupitsvegan and #yupitsvegan. I love hearing from you! 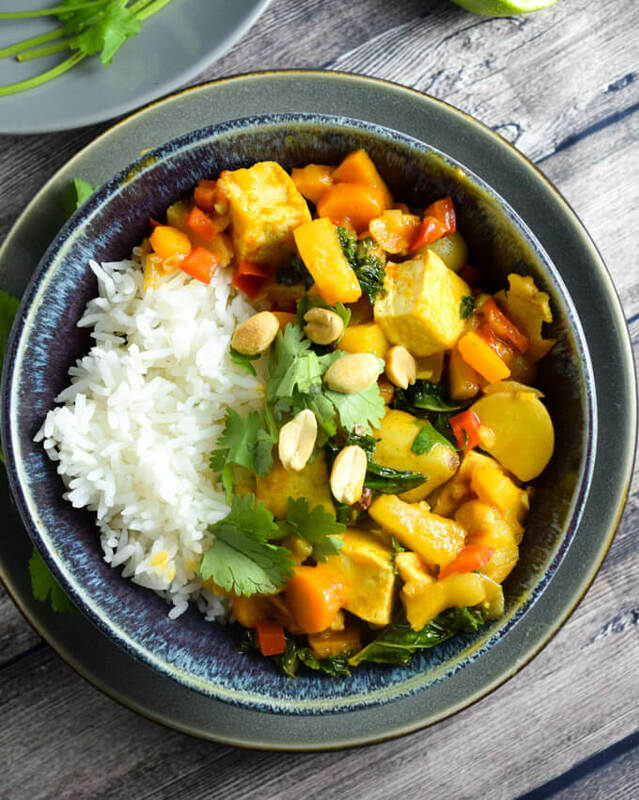 Hearty and flavorful triple P curry! 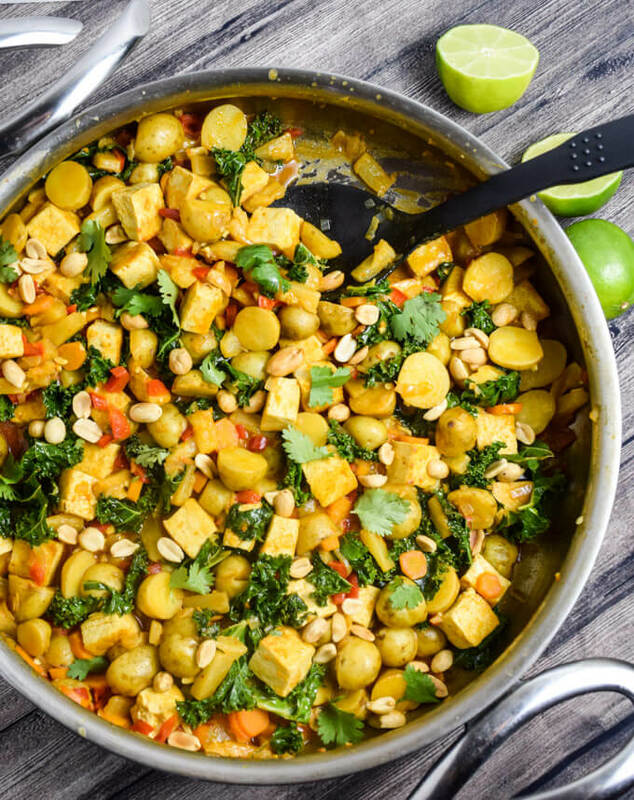 This peanut, pineapple and potato curry is easy to make, crowd-pleasing, and makes great leftovers! Plus, it's vegan, grain- and gluten-free. Warm the oil in a pot over medium heat. (A soup pot actually works better for this recipe than the wider one pictured in the photos). Add the shallot and garlic with a pinch of salt, and cook for about 2 minutes, or until the shallot is softened slightly. Add the ginger and turmeric, and cook for another 30 seconds. Add the red curry paste, stir as best you can, and cook for 60 seconds more, until fragrant. Stir in the halved potatoes, bell pepper, and carrot, and cook, stirring, for 2-4 minutes, or until the veggies are nicely coated with the aromatics mixture and the bell pepper is slightly softened. Add the coconut milk, pineapple, and soy sauce. Bring the mixture to a boil, then reduce to a simmer. Cover the pan and cook, stirring occasionally, until the potatoes and carrots are done through, around 30 minutes. If using the tofu, cut each cooked piece of tofu in half (this is to ensure each tofu piece has a cut edge to better absorb the curry sauce), and add it to the pot. Stir in the chopped kale. Cover the pan and simmer for 3-4 minutes, or until the kale is bright green and wilted. Turn off the heat and season to taste with lemon or lime juice, and additional salt. Stir in the roasted peanuts. Serve hot with accompaniments of choice (rice, etc.) and with chopped fresh cilantro and more peanuts if desired. Leftovers keep well for up to a week in the fridge and also freeze well. Nutrition facts exclude rice and tofu. Delicious. We really enjoyed it. I left it without tofu. What a brilliant combination of flavours. I would like this with regular or sweet potato!